Given the choice, I'd much rather bake a cake than relax in front of the TV, but my favourite evening-at-home activity has to be decorating them. My brother started the trend. For years he's been the family birthday cake-maker, always concocting something the bday boy or girl loves, in cake form. Over the years I've been sung to over a cake newspaper and a cake tennis court (he's borrowed from his niece's Lego set for some little Andy Murrays); he's also whipped up cake iPads and gardens, football matches and knitting sets. But this year, with my sister's birthday approaching, our bro was on holiday. A cake chasm emerged: gingerly, I stepped in. 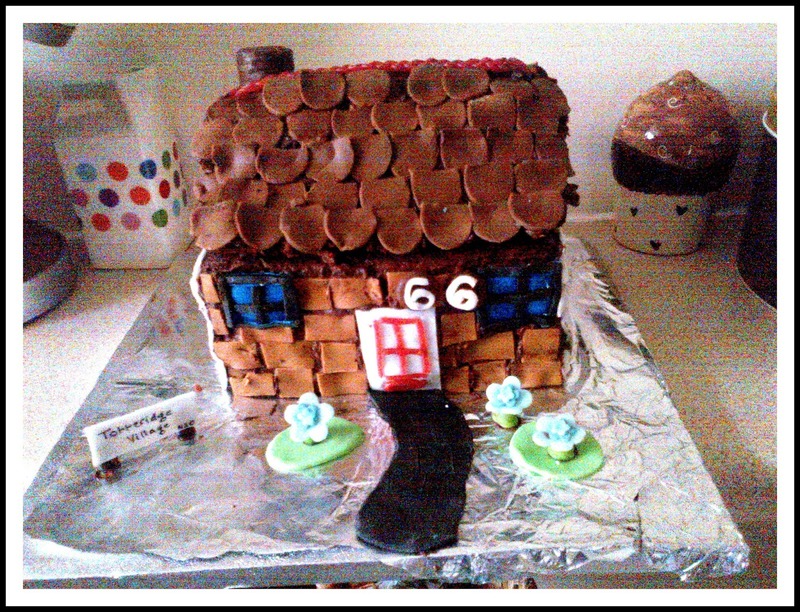 I thought of a theme: a sugar version of my big sis's house , which she'd just had extended after a looooong legal battle (and blogs about here). 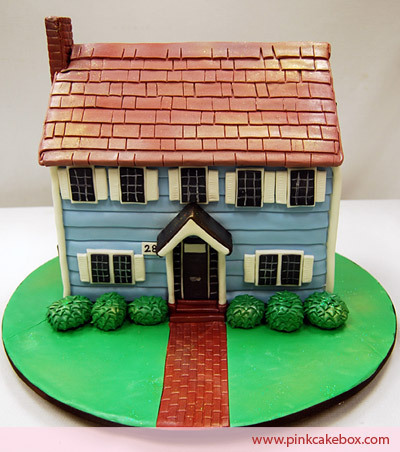 If you're looking for a house cake, I also found loads more inspiration here. Elsewhere, recipes would suggest rolling out icing sugar out onto tile moulds for the roof, and using polystyrene support systems for the porch. That's not my idea of cake-baking: the ingredients alone are expensive. I'm not going to shell out on a million types of moulds I'll use once. 1) Bake four rectangular cakes. I know, four: it's loads, especially if like me you only have one rectangular cake tin and have to bake in batches. But you can at least make the batter all in one go. I tried a few different chocolate cakes and found the sturdiest for construction and most delicious for munching to be Nigella's old fashioned chocolate cake. 2) Once they're all cooked, cooled and released from their tins, it's construction time. Make up a triple quantity of the above recipe of icing, or your own chocolate frosting if you prefer. This is your mortar..
3) One of the cakes needs to be cut up into a roof shape. You cut two triangles off the edge of the cake, then stick them upside down on the top of the trimmed cake. But that won't make much sense: luckily an amazing internet bod has made an easy diagram of it here. 4) Now layer the three cakes, cemented together with icing, and the roof on top. 5) And now, the fun bit: decorating. I use Tesco ready-rolled fondant, cos life's too short to fuss with DIY. Add a drop of red, blue and green food colouring (the only ones I have, but you could just buy brown or use a liquid cocoa) to roll out brown for the tiles. I used the head of a ginger bread cutter to make lots of tiles, then popped them in the fridge for an hour to stiffen, before laying them like a roofer, with icing mortar. I used a Cadbury's Mini Roll for the chimney. 6) The bricks: I made these from the same fondant, cutting long strips of brown then chopping across with a sharp knife. I made short and long tiles, an easy way to add realism. The windows were white fondant and red shoelace sweets for the lattice. TIPS: if you can, make your fondant decorating parts a few days in advance. 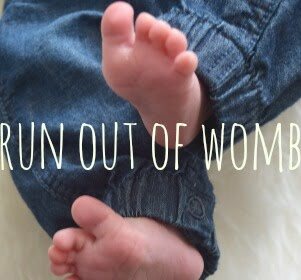 They'll harden up, and be easier to stick on the cake (use a pastry brush or your finger plus a little water as glue), plus it's way too tiring to do all that baking AND decorating in one go.